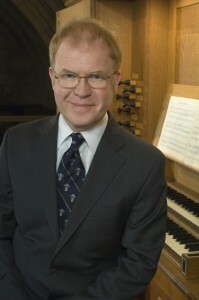 John Scott was raised a Cathedral chorister in Yorkshire and served as organ scholar at St. John’s College, Cambridge, where he assisted George Guest. He studied with Jonathan Bielby, Ralph Downes, and Dame Gillian Weir, and made his debut in the 1977 Promenade Concerts at Royal Albert Hall, then the youngest organist to do so. On leaving Cambridge, he was appointed assistant organist at London’s two Anglican cathedrals, St. Paul’s and Southwark. During this time, he won first prizes in the Manchester and Leipzig J.S. Bach international competitions. In 1985, he became sub-organist at St. Paul’s, and, in 1990, organist and director of music. Dr. Scott has performed on five continents in many of the world’s most prominent venues, premiered many works written for him, and collaborated with specialist ensembles. He recently performed the complete organ works of Buxtehude and Messiaen to commemorate their anniversaries. He is a prolific recording artist, and has served on many international competition juries. He also has published many choral compositions and arrangements, and co-edited two compilations of liturgical music, published by Oxford University Press. In 2004, after twenty-six years at St. Paul’s, Dr. Scott was appointed organist and director of music at Saint Thomas Church Fifth Avenue, New York, where he directs the renowned Saint Thomas Choir of Men and Boys. He was awarded the Lieutenant of the Royal Victorian Order in the New Year’s Honours List in 2004, and, in 2007, was awarded an Honorary Doctorate of Music from Nashotah House Seminary.